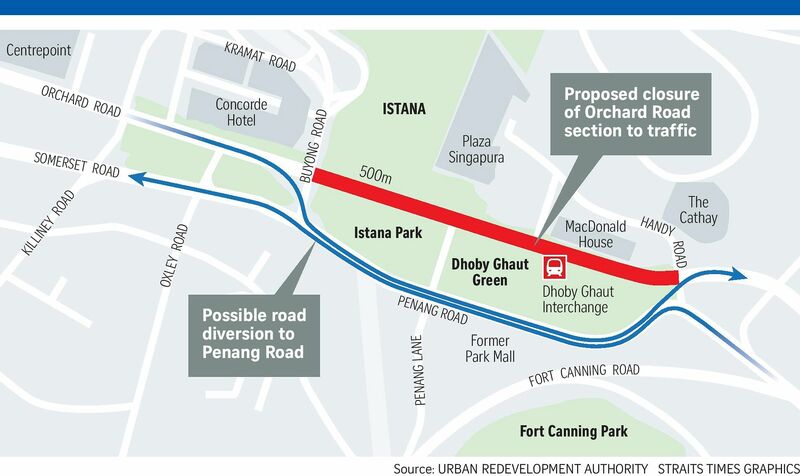 Travelling from one end of Orchard Road to the other will eventually be a very different experience, as plans are afoot to transform the 2.4km stretch into a more lively street with different offerings in each of its four sub-precincts. These were among the proposed plans to rejuvenate Singapore's shopping belt unveiled yesterday, following a six-month study and consultations with stakeholders. In a joint statement, the Singapore Tourism Board, Urban Redevelopment Authority and National Parks Board (NParks) said new retail concepts, attractions, entertainment and events will be introduced to the Tanglin, Somerset, Orchard and Dhoby Ghaut sub-precincts to strengthen Orchard Road's position as a lifestyle destination. Tanglin will be branded a mixed-use neighbourhood with arts and artisanal choices, with the conserved Tudor Court, for example, housing more arts and cultural offerings. To "bring back the Orchard", NParks is also looking to plant more trees and shrubs along Orchard Road, starting next year, with a different colour palette for each sub-precinct. Experts say that the ideas are a good move, but the real transformation needs to happen inside the street's malls. Speaking yesterday at the launch of Design Orchard, the realisation of the local retail and incubation space, Trade and Industry Minister Chan Chun Sing said that Orchard Road has come a long way from its days as a nutmeg and clove plantation, and must continue to be a place of innovation and evolution. "Orchard Road is not a 2.4(km) IPPT run; we are not aiming for people to pass through Orchard Road in five or 10 minutes. We want people to come here, linger and make sure that they have a different experience at each and every turn," he said, referring to the Individual Physical Proficiency Test.